Contest: Win hardback copy of AN EMBER IN THE ASHES and a $10 Amazon gift card! 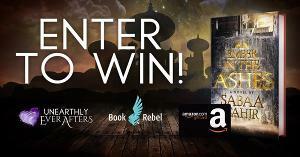 Win hardback copy of AN EMBER IN THE ASHES and a $10 Amazon gift card! Prize: hardback copy of AN EMBER IN THE ASHES - book 1 in Sabaa Tahir's #bestselling series PLUS a $10 Amazon gift card! Statistics: This contest was opened by 86 and entered by 3 ContestChest.com members. 3% of those who opened the contest, entered it.